Training workshops on SPSS at Karachi. 1. Training workshop on "Learning Data Analysis through SPSS" from 07-02-2018 to 08-02-18 with collaboration of Peoples University of Medical & Health Sciences for Women, Nawabshah, and Jinnah Sindh Medical University Karachi. Dr. Nazir Khan, Director ORIC, Mr. Sajid Aleem, Lecturer and Ms. Sarah Wahab, Lecturer, from Jinnah Sindh Medical University Karachi, were the Resource Persons. In the opening session the chief guest was Prof. Dr. Shamsuddin Shaikh, Pro Vice Chancellor, and Peoples University of Medical & Health Sciences for Women, Nawabshah. In the closing session Prof. Dr. Azam Hussain Yousfani, Vice Chancellor, Peoples University of Medical & Health Sciences for Women, Nawabshah was chief guest. More than 40 participants attended the workshop. 2. 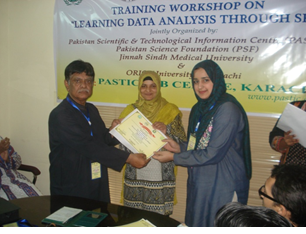 Training workshop on “Learning Data Analysis through SPSS” from 12-02-2018 to 13-02-2018, with collaboration of ORIC, University of Karachi and Jinnah Sindh Medical University Karachi, at PASTIC Sub Centre Karachi. A total of 19 participants attended the workshop. Mr. Sajid Aleem, Lecturer and Ms. Sarah Wahab, Lecturer, from Jinnah Sindh Medical University Karachi, were the Resource Persons. Participant receiving certificates from Mr. Abdul Fatah Shaikh in closing ceremony.